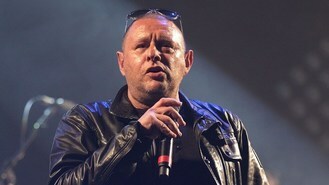 Happy Mondays and The Farm were among the first bands to take to the stage at this year's Isle of Wight Festival. The sun has been shining down on thousands of music-lovers as the bands take to the stage for the first full day of the first major festival of the summer. The Stone Roses are the headliners on Friday with The Killers following on Saturday and Bon Jovi performing for the climax of the event at Seaclose Park, Newport. Sir Bob Geldof will also be making a special appearance on Sunday when he appears with the reformed The Boomtown Rats after a 26-year break. Scenes of traffic chaos at last year's event, caused by heavy rains turning the car parks into mudbaths, haven't been repeated this year with revellers arriving in the sunny but windy weather. Pete Donaldson, presenter for Absolute Radio which is broadcasting live from the event, said: "The Isle of Wight Festival has opened to blazing sunshine - the crowd are swathed in beer and Stone Roses T-shirts." Some Bon Jovi fans have been disappointed that guitarist Richie Sambora will not be performing after he recently quit the group's North American tour. But Sir Bob has hinted that he may be appearing with Jon Bon Jovi during his headline show. Other acts performing at the festival include Paul Weller, Emeli Sande, Jake Bugg, Everything Everything, Blondie, Imagine Dragons, Ellie Goulding, Rizzle Kicks and Republica. Britney Spears' sons are to star in the video for her new single Ooh La La, which features on the soundtrack for the Smurfs 2 movie. Kanye West has roped in Kourtney Kardashian's partner Scott Disick to help promote his new album Yeezus. Taylor Swift has confessed she sometimes gets put off her performance at gigs trying to read the signs her fans are holding up in the crowd. Avril Lavigne has said she has moved on from singing about "boy-bashing and break-ups". Chart-topping metallers Black Sabbath marked their comeback tonight with a double win at a top rock awards event. Jack Johnson honoured Mumford and Sons as he stepped in for the British band at the Bonnaroo music festival in Tennessee. Drake made a surprise appearance at Canada's MuchMusic Video Awards, where Avril Lavigne and Justin Bieber also took home prizes. Jack Johnson has come to the rescue at the Bonnaroo Music and Arts Festival after Mumford and Sons were forced to cancel.